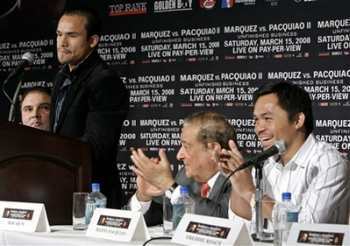 LAS VEGAS, NEV (August 30, 2011) – Congressman MANNY “Pacman” PACQUIAO and JUAN MANUEL MARQUEZ, fresh from their stop in Manila, will kick off the North America portion of their 25,000-mile international media tour, for their mega world championship fight, with a New York News Conference luncheon Next Tuesday! September 6, in the The Lighthouse at Chelsea Piers – Pier 61 (23rd Street at the Hudson River, New York, NY 10011). The report time will be 9:30 a.m. ET with the news conference beginning at 10:00 a.m. ET. The Media Lunch will be served at the conclusion of the news conference at approximately 11:00 a.m. ET. The news conference will be open to the public. Opening the press conference will be international recording star DAN HILL who will join Pacquiao in a live rendition of their Top-10 hit single Sometimes When We Touch. Pacquiao and Marquez, who have won world titles in 11 weight divisions between them, will go toe-to-toe for Pacquiao’s World Boxing Organization (WBO) welterweight championship on Saturday, November 12, at the MGM Grand in Las Vegas, Nev. Pacquiao-Marquez III is Act Three of their exciting world championship trilogy that has had fans and media standing on their feet for 24 action-packed rounds. Joining Pacquiao and Marquez at Chelsea Piers will be their respective trainers, World-Famous Freddie Roach and Ignacio “Nacho” Beristain, and Hall of Fame promoter Bob Arum. Promoted by Top Rank, in association with MP Promotions, Marquez Boxing, Tecate and MGM Grand, Pacquiao vs. Marquez III will be produced and distributed live by HBO Pay-Per-View®.